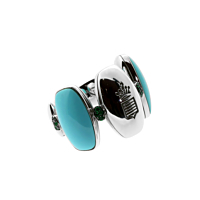 Verdant Emeralds and vibrant Turquoise alternate across this 18k White Gold Ring by De Grisogono, offering one of the jewelry world's most rare and coveted combinations. 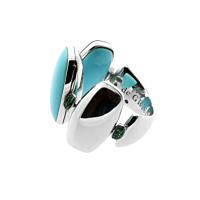 There are a total of 16 Round Emeralds (comprising .10ct) and 3 Cabochon Turquoise (10.5ct) to admire, and the vivid colors are made all the more enticing when paired with the classic White Gold frame. A truly stellar piece!